The Storytelling Book of the Ancient Traveler — Absolutely Wild! Are you a young writer, artist, or creative? Enter your creative work to earn a publishing credit and a chance to win a $100 prize. This is a call for young writers and creatives (ages 15-ish to 25-ish)—and invited professionals—to submit content for potential inclusion in The Storytelling Book of the Ancient Traveler. James Artimus Owen—author/illustrator of the Chronicles of the Imaginarium Geographica—contributed his brilliant work to jump-start the book with his opening pages. For this, we owe him a HUGE thank you. If selected for the one-of-a-kind, hand-bound, leather volume, your creative work will be published alongside entries from other young creatives and professionals. Simply select one of the items on the Ancient Traveler's List of Objects below, write a short story or create an illustration following our guidelines, and submit it by email. There is no cost to submit your work. This “synergy arts” project concept is the brainchild of Joanne de Biasi, and will be brought to fruition through Absolutely Wild!, as it completely fits our mission. We will auction the completed book to support creative endeavors of young creatives, like you. Plus, we will draw one name, from among the 84 entrants who submit creative works, for one $100 prize. We're interested in customizing our support to the needs of young creatives, so share with us what might help you succeed. Or, if you're a professional, please share what most helped you evolve to where you are now. 2. Complete a form to register your entry, providing your choice of object, type of submission, and contact information. 3. Following our Submission Guidelines, submit electronic files of your creative work to Fae@AbsolutelyWild.net. 3. Absolutely Wild! will compile selected works into the original bound collection to be auctioned. 4. Selected submissions will receive publishing credit. 5. A paperback edition of the book may also be published through Amazon. 6. Absolutely Wild! will use proceeds to support young creatives in unique and beneficial ways, including at least one $100 prize from among those who submit creative work to The Storytelling Book of the Ancient Traveler. 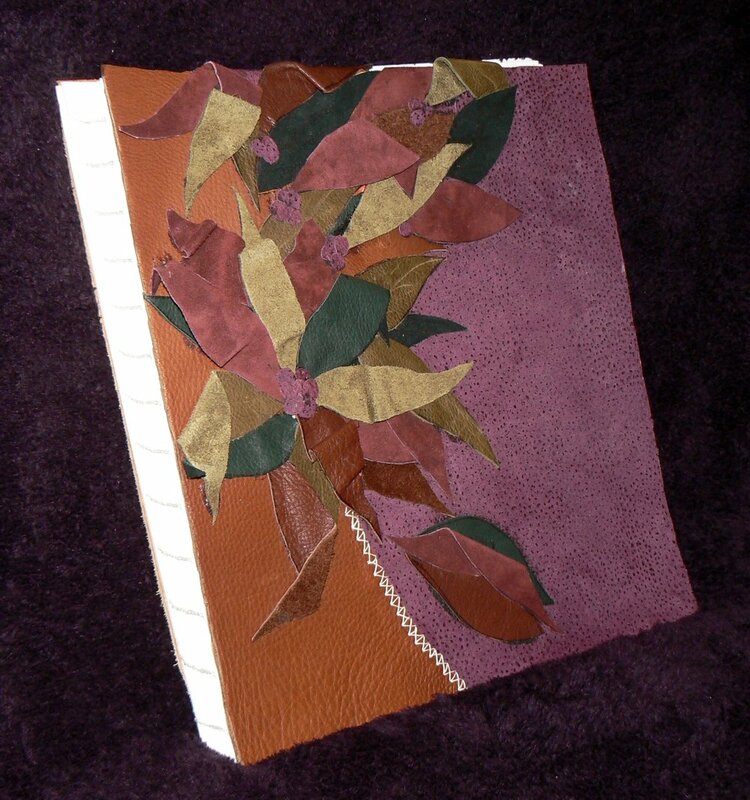 Leather cover and hand-stitched volume, created by Joanne de Biasi, the mastermind behind this project. Pick one object for your story or art topic. We'd love to see a story and an image for each item. Objects in bold are James Owen's ideas (pictured above right). James A. Owen's enticing title page. To give you some scope, the page size in the one-of-a-kind, hand-bound, leather volume of The Storytelling Book of the Ancient Traveler is 13" x 13.75." Your entry will be laid out with text and image, and printed on acid-free 12" x 12" paper, which we'll secure in the book. The stories and images should be about one of the objects from the provided List of Objects. Others may choose the same object... we're not necessarily trying to secure one of each, as we want every contributor to be inspired. However, we will admit only one writing entry and/or one art entry per person. So, you may submit either writing or art, or one set of each. Sorry creators, but to give more people a chance to be in the book, we cannot accept two writing entries, or two art entries from the same person. To enter, you must be approximately within the age range of 15 to 25 years, unless you are one of our professionals. All submissions must be in electronic format, using the parameters described below. We request you send submissions to be received by Absolutely Wild! by midnight on the first day of each month until the book is filled. JPG format, with color set to CMYK. 1. Fill out this form to register your entry. 2. Email your story and/or art in a separate email to Fae@AbsolutelyWild.net. Please reference your first and last name, email, and phone number when submitting your entry so we can match it to your registration. Please tell us whether you consider yourself an emerging young creative, or an established professional (consistently paid for creative work). Where did you hear about this project? I agree to allow AW to enter my name into a giveaway drawing for one $100 scholarship from among the 84 entrants who submit creative work. The drawing will be done once AW receives 84 art and/or writing entries.